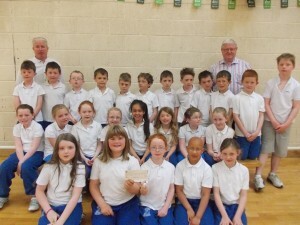 Picture are of 2nd class with cheque from their communion. Also the 1st and 2nd went on a tour and stopped at Kellys where Seán gave the children sausages and chicken in the alley beside of the shop because of the rain. He covered the charge and asked that a donation be made to a charity. Rock Rose House was selected. Padraigh Barrett collected a cheque for €100 today.